While your replication instance is being created, you can specify the source and target database endpoints using the AWS Management Console. However, you can only test connectivity after the replication instance has been created, because the replication instance is used in the connection. 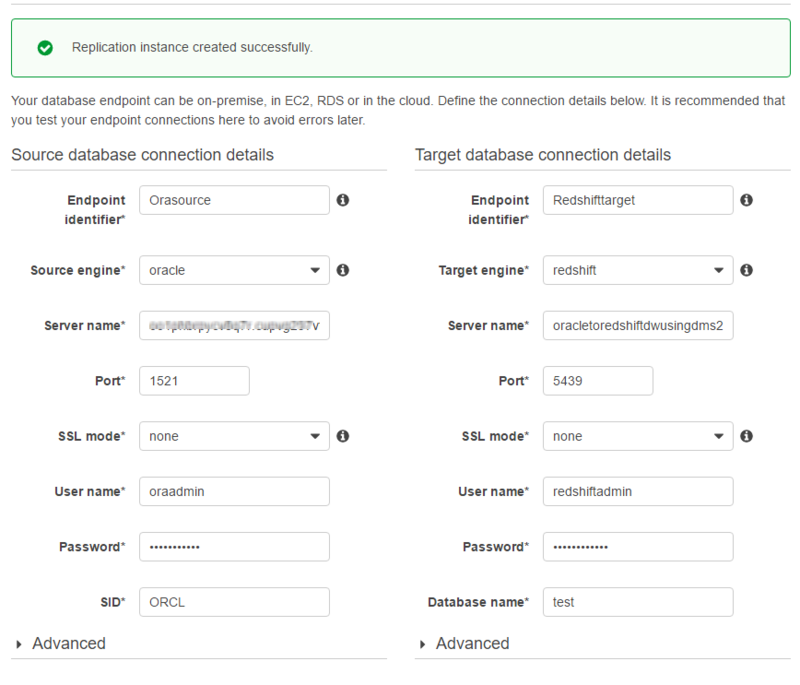 Specify your connection information for the source Oracle database and the target Amazon Redshift database. The following table describes the source settings. Type Orasource (the Amazon RDS Oracle endpoint). Provide the Oracle DB instance name. This name is the Server name value that you used for AWS SCT, such as "abc123567.abc87654321.us-west-2.rds.amazonaws.com". The following table describes the target settings. Type Redshifttarget (the Amazon Redshift endpoint). Provide the Amazon Redshift DB instance name. This name is the Server name value that you used for AWS SCT, such as "oracletoredshiftdwusingdms-redshiftcluster-abc123567.abc87654321.us-west-2.redshift.amazonaws.com". The completed page should look like the following. Wait for the status to say Replication instance created successfully..
To test the source and target connections, choose Run Test for the source and target connections.